If it’s just you managing communications for your charity, you don’t have to feel alone. There’s an army of volunteers on the ground ready, willing and ideally placed to be the external voice of your work. At FoodCycle, we let our volunteers' voice shine through to tell the charity’s story. Here are my tips to harness their skills, energy and experience, without living in constant fear of a comms disaster. The communications for every FoodCycle project is led by our volunteers and this is a very deliberate decision. All our projects across the country have their own Twitter and Facebook pages, send out press releases, speak with journalists and are regularly interviewed on local radio. This devolves the power from head office to local projects, empowers our volunteers and makes use of their skills. Plus, it feels like common sense: our volunteers are much better placed to tell the stories of meals cooked, lives changed and communities built than those in HQ. Instead of being precious, we’ve let loose of the reins and bust the myth that comms has to come top-down. Of course, there has to be consistency of message. That’s why our volunteers receive media and communications training at our conferences where they take part in workshops and role play sessions as well as receiving resources that give them the skills and confidence to manage their own external comms. We share our brand guidelines, tone of voice guide and social media policy with our volunteers and make sure they feel confident using these resources. They know they can always ask HQ questions, or get support for media interviews before they take place. A word of advice: we always set up social media accounts centrally – this means we can make sure they are on brand and admin rights aren’t lost should a volunteer move on. Yes, there is always the danger a volunteer could go rogue. A volunteer being overtly political or inadvertently damaging relationships with important stakeholders is always a concern. We monitor our project communications channels regularly. It keeps us in touch with our work on the ground and means any potentially damaging message is flagged at the earliest opportunity. We manage our relationships by keep channels of communication open with our volunteers. If a Facebook post isn’t appropriate, having a good relationship with a volunteer means it's easier to explain our reasoning and for them to learn for the future. (Re)move: the last resort. If a volunteer has put out a message that is particularly damaging, as the communications professional in our organisation I am responsible for the charity’s brand and reputation and can remove a damaging message if necessary. Having the opportunity to be responsible for FoodCycle Lewisham’s marketing has provided me the freedom to unleash some of my pent-up (corporate) creativity whilst giving something back. 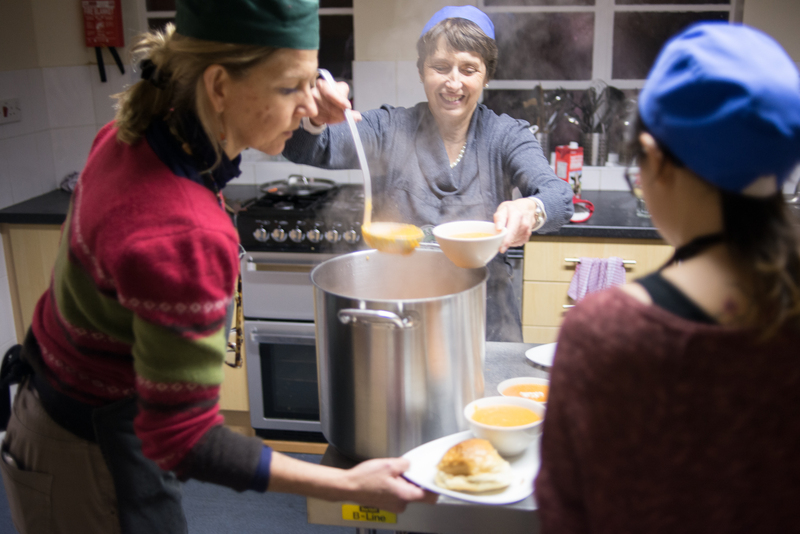 FoodCycle is somewhat unique in its liberal approach to giving Hubs sole responsibility to be the external voice of the charity. Detailed brand guidelines are provided to guide us and the team at FoodCycle HQ is always there in a flash if any questions do arise. Managing the marketing side of the FoodCycle Lewisham is extremely rewarding. Witnessing the rapid growth and engagement throughout the social channels and reading the kind words and enthusiasm from supporters gives you the drive to always generate more exciting content and further the FoodCycle message across the UK (and beyond!). I would highly recommend anyone interested in communications to get involved in your local FoodCycle – it'll be worth every minute of your time. Not only are you giving back, but it's a great opportunity to be creative and further your communications skills. You can see the success of this approach yourself. Take a look at FoodCycle Bath on Facebook, FoodCycle Cambridge interviewed on local radio, FoodCycle Exeter on Twitter, FoodCycle Peckham's piece in Closer magazine or FoodCycle Portsmouth's brilliant blog to see some great comms from across our Hubs. I’m constantly inspired by our volunteers and the amazing things they do to promote FoodCycle’s work. If, like me, you are the only person in your team running communications, take a moment to look around. You may find volunteers, beneficiaries, ambassadors or patrons willing to sing from the rooftops about the great work of your charity.